Here' some good news for all cheese lovers out there. 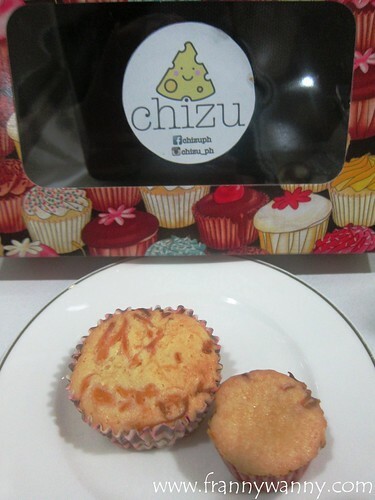 Check out what I recently discovered during my last visit to Manila -- Chizu Cheese Cupcakes! 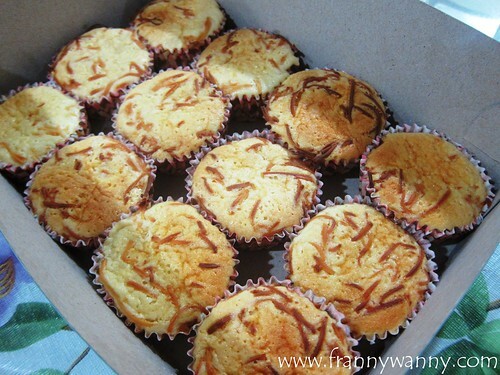 I remember growing up and enjoying homemade cheese cupcakes which is slightly crunchy on top and super soft and moist inside. I just love nibbling on the toasted grated cheese normally spinkled and baked on top. These sells like hotcakes so we normally would get a freshly baked batch every time. Chizu is the modern-age cheese cupcakes which stays super creamy inside and out. These comes in two sizes: Chizu Regulars (Php. 350/12 pieces) are the same size that of a regular cupcake while the Chizu Bites (Php. 150/12 pieces) are so cute and tiny that you can easily pop into your mouth. Be careful though as these babies can get so addicting that before you know it, you've consumed the entire box already! That almost happened to me had it not been for Paul who told me to save some for him too. I wasn't able to ask how many kinds of cheese were used in this recipe but I'm pretty certain that there's more than one. The flavor was a perfect combination of salty and sweet. It has a very nostalgic taste to it especially for kids who grew up in the 80s and who had the chance to try those homemade cupcakes back then. To order, call Chizu at +63 (917) 5066269 and like them on Facebook. Oh man, that looks delicious. It reminds me a lot of pao de queijo, although it's not stretchy. Do you know how it compares taste-wise?